"Flow Mingled Down" is only $15.00CAN plus taxes and shipping where applicable! Resonant Drift "Flow Mingled Down"
"Flow Mingled Down" by Resonant Drift is a fascinating journey in sound, where environment and atmosphere develop through a masterful manipilation of tone and melody. Bill Olien of Resonant Drift shows a tremendous talent for the creation of aural landscaping throughout the disc, a tallent which will surely appeal to listeners who crave spaces made within their music. It begins with the track "Until" where a choked arpeggio plays overtop a series of pads, loose and irregular in shape at first but building in strength and purpose until form and structure gradually emerges. This is a great example of the idea of order in systems, a work where the total is very much the sum of it's parts. Title track "Flow Mingled Down" follows, a very evocative piece where the listener is completely immersed in a highly detailed aural soundscape where samples and tones suggest a jungle or forest. It's quite a vivid experience, very well executed. "Is This the Dream?" follows a similar path, combining atmosphere and space with thick analog sequences to create a dense form that completely envelopes the listener. Thick layers of drones combine in "Indescribable" to create a deep tonal well haunted by indistinct voices just on the edge of being understood. It's an ominous sound, a track filled with fear and nerves, yet not without a sense of beauty in darkness. "Within, Still" maintains the haunted feeling, a musical world filled with dark hallways and locked doors, the subtle chiming of bells and rising moans just at the edge of the senses. These two tracks in particular display Olien's mastery of the soundscape medium. Track six, "Moment", brings us out of the shadows and into a more inviting space, a fully realized environment very succinctly created in the track's short time span. There's a true talent in being able to form such a complete image so quickly and Olien proves himself to be up to the task and more. A truly impressive track. "Spiral Nowhere" blends pads and drones with analog sequences to bridge a gap between forms. It's a fine example of the marriage of genres, working on the levels of both stylistic homage and it's own distinct identity. With track eight, "Moment Again", the mood returns to a darker, more subdued tone, something based a little more around atmosphere than melodicism. Once more Olien demonstrates how easily he can create an environment in such a short time using succinct tones and spaces. A wonderful track that blends in almost seemlessly with the percussive track "Yearning", a natural progression of spaces and shapes again appealing to a more structured form. Very nice. "Ground of All" has a majesty about it, a particular sense of grandeur implied in it's rich tones and thick sounds. Don't expect any pomp and circumstance, it's largely a drone based work so don't look for any trumpet flourishes, but you'll know what I mean when you hear it. The track has a feeling of richness to it that permeates throughout, something that can't be denied once it's been heard. "Sorrow and Love" closes the disc, incorporating romantic sweeps with the flow of water and waves. It's a beautiful track, a lovely way to close the disc and a lovely summation of the work that Olien has created. To be able to evoke an image of a space is a wonderful talent, but to be able to bring to mind an emotion, a feeling, so clearly as this is truly a gift. A wonderful way to end the disc. Needless to say, I'm one of those listeners that I mentioned earlier, the kind that craves space within the music they listen to. I enjoy a disc that implies a space through it's use of sound. 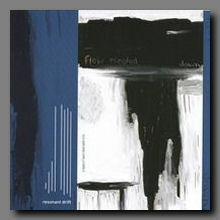 Resonant Drift is a project that succeeds admirably in that goal, and I can heartily recommend "Flow Mingled Down" as an excellent addition to the CD collection of anybody who feels similarly.